Q. How can I be alerted to new items acquired by the library? If you just want to view new Arrivals classifed by broad subjects. 1) If you wish to setup alerts via email refer to the instructions below. For setting up alerts of journal articles or for Table of contents to be emailed to you, refer to JournalTocs service. You can use myLINC, if you wish to be informed of the latest books acquired by the library. This alert service can be set up for your favorite author or any subject of your interest. 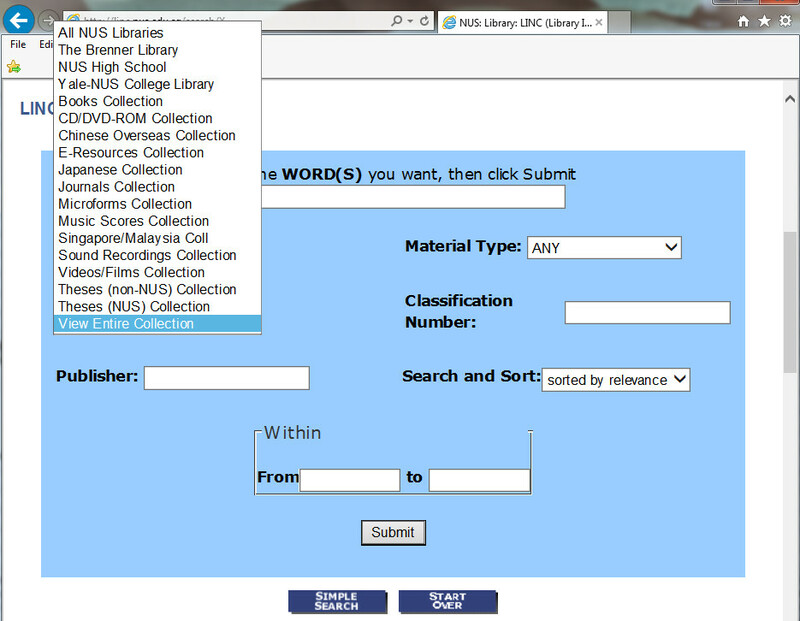 After login, click 'Search the catalog' in the upper frame (This applies only if you have no existing saved search, if you do have saved searches just go to http://linc.nus.edu.sg/ and do a normal search). Do any type of search you desire. To set up alerts for new books received by a library, use the Advanced Keyword option and enter the keyword you want. a specific library - Type * in the search box and click on the‘View Entire Collection’ drop down menu to specify the library of your choice, e.g. Science Library. Click ‘Submit’. At the results screen, click 'Save' to save your search strategy. Next, click 'Patron Record' to view your library record. On the next screen, you would notice that there is an extra button, 'Preferred Searches', in the upper frame. Click on this button to see the search strategy that you have saved. In the column 'Mark for Email', check the box against the preferred search that you wish to save as an alert. Finally click the 'Update List' button to save the changes. If the library acquires any book on your subject, your favorite author, etc., you will be informed weekly by email. Alternatively you can set up alerts by subjects to appear whenever you login to the library portal. see the following guide by medical though the procedure applies for all subjects.